I had an image posted some time back and in the back ground was my fringe twister. One commenter asked me to show it more clearly and perhaps discuss how I use it. Sorry I don't recall your name, but at long last here is your post. I seem to use only two of three clips but have used the three and found it produces a nice firmly round plied fringe. I have put many miles on this puppy! But the only thing I have had trouble with is the black 'o' ring that enables it to turn. It dried out and cracked. But I found another perfect fit at a automotive hardware store and I was back in business. Speaking of business...here's the business end. Notice the grippy plastic tips. They really hang onto the yarn and in this case slippery tencel. So down to work. I have four scarves all in need of twisted fringes so I'll be busy with this for a time. Later some beading may be added and I'll post that separately. I don't do 'free-hand' twisting but have a system that I devised to get even knots and better looking fringes. My logic is "why go to all that work and not finish it right?" I believe the finishing makes or breaks the handwoven item. First I get a part sheet of insulating Styrofoam. My husband was working on a project in 1999 or 2000 and I scavenged a piece of the board. I've been using this board ever since so I don't feel guilty about it. The high density means you can use it for years before needing a new one. My board is about 3' x 2 .5' and I then took a yard stick and permanent marker and made one inch increments up and down all sides (and even the back in time.) I then pin out my project, in this case both ends of two scarves. I use extra long stainless steel 'lace' pins. I just like the extra length to work with. I pin out quite heavily! This project is 24 epi, with the fringe hemstitched into groups of 4 ends each. I am twisting two groups of four against each other. Each twisted fringe contains a total of 8 ends. I then twist them in a clockwise direction for a given count, in this case 35 revolutions. Yup, you must count in order for all to be even. Then I place the two twisted groups together onto one clip and then twist counter-clockwise for the same number, 35. Then I use a long trapunto needle used for making dolls. It's like a very long bodkin needle. Again, I like the extra length but a darning needle will do. I make an over hand knot near the end of the twisted group and slip the needle into the middle before you close it! Then place the tip of the needle onto the given measurement line you are using for the length of your fringe. Once you are happy with its position, let go and gently snub the knot tight. Presto, all the same length. Once the scarf has been wet finished, and pressed. I then use a cutting mat and rotary cutter to trim up the end of the tassel for that sharp look. Depending on the scarf length, and the twisted bout's thickness, I will leave approximately 1/2" or a little less of tassel. I took my scarf board and projects over to a fibre group meeting the other day and everyone there said "it's so simple but so effective". By using firmly pinned out project and applying a bit of tension on the yarns when twisting, all is under control. 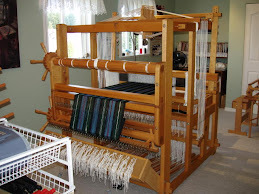 Think when you are beaming a warp... threads under tension are threads under control. Please try this out and if you like it, share with your friends. Kent by day is a mild mannered office worker and on his days off, he's a high altitude hiker. This love of hiking has meant that he's hiked all the high points around Vancouver such as The Lions or Golden Ears Park. He also gone to Alberta and hiked around peaks in the Rockies. The picture above was taken at his other favourite place Garibaldi Provincial Park. 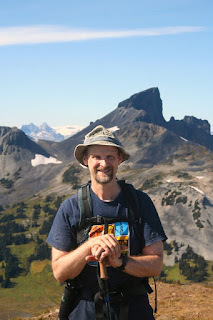 In this picture he was standing on Panorama Ridge this past September 7th after hiking for 4 1/2 hours to get there. The peak in behind is known as the Black Tusk. 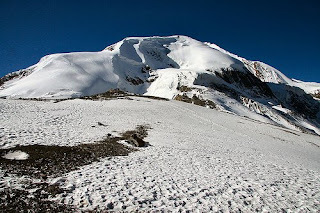 He had spent the spring (once the snow had mostly left the alpine areas) and the summer training. 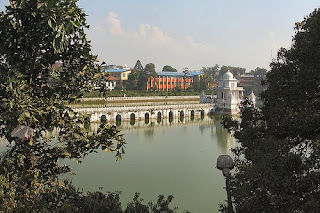 In October Kent took many flights until he reached Kathmandu, Nepal. He was about to hike the Annapurna Circuit. 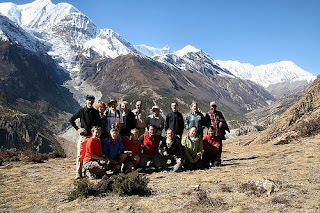 In Kent's first trip to Nepal they had eventually hiked to the base camp of Mt. Everest where all mountaineering summit attempts start. This time they are essentially hiking around the base of the Annapurna peaks and included was a flight to view the Annapurnas. They were incredibly lucky to find them cloud free that day! This was a trip that lasted close to three weeks and now forever in his memory. He flew out to Sinagpore, and then Korea, and back home with 800 images and has been sorting through and cataloguing them. So this post will feature some of the pictures taken this past October as my guest blogger and 'paparazzi'. Trust me when I say that these smaller images just don't do the originals justice! Then to keep to the fibre content of my blog, I'll show you the lovely textile gifts he brought me back from his first trip in 2004. 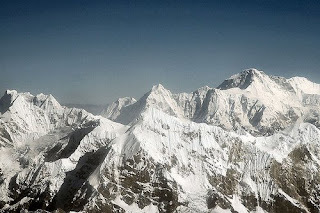 Kent says: this was taken on a flight to Mt Everest that took place before I began my Annapurna Circuit Trek. The plane flew as close as it could to the Solu Khumbu region where Everest is located and then turned around and headed back to Kathmandu. 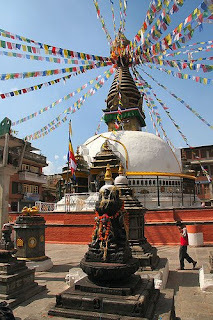 I was walking to Thamel; a tourist shopping area in Kathmandu to find a Pilgrim's book shop when I came across this Buddhist stupa. There are several around the city and the logic of these are that while your on your way to work for example you can check in at the local stupa. 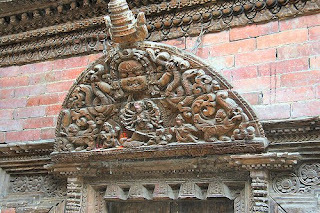 This was an intricate wood carving above the door in the temple devoted to The Kumrai Devi who is a living goddess. The Kumrai is a young girl chosen from a select family and her features and personality are carefully checked to see if she can be a Kumrai. Once she attains puberty, then she can no longer be a Kumrai and another is required to be chosen. 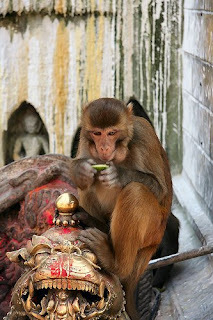 This was one of the many resident monkey's atop the Swayambhunath Temple, or more commonly known, "the monkey temple" which rests on a hill within the city of Kathmandu. 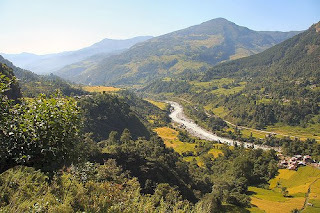 This was the view looking back and down towards Besisahar where we began the trek early in the day. It was a beautiful day and it had taken us many hours to reach the high point were this photo was taken. We were hiking along through trails towards Bahun Danda and came across several homes along the way. 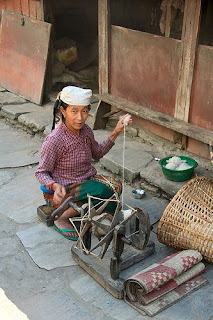 I was suddenly captivated by this Nepali lady doing some spinning. We asked her if we could take her photo and she said yes. She seemed so pleasant and happy and she made us feel welcome. 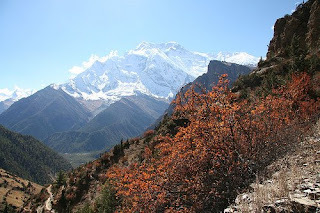 This was taken on the trail looking back while heading up and out of the village of Manang. A group photo taken near the Praken Gompa where we met a 92 year old Llama to receive his blessing for the crossing of the Thorung La pass. What a great day this was! 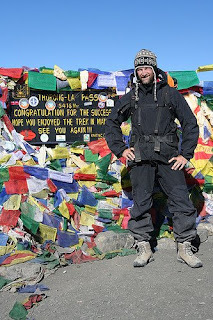 Here Kent is striking a pose at the Thorung La Pass summit. It's 5416 meters above sea level. This is the peak of Thorung La above the pass they have climbed. Prior to making the climb to the Thorung La Pass, I found this loom in the Cultural Museum of the village of Manang. We had done an acclimatization hike to the Praken Gompa to receive a blessing earlier in the day. We had the afternoon free to wander around Manang to shop and my bunk mate Andrew and I went to the museum. I was quite impressed by the artifacts dating back many years. I wonder if you would like to use this loom eh? What a lovely surprise [to find] this as I was walking around the Manang Cultural Museum. An old loom created out of branches and pieces of wood. 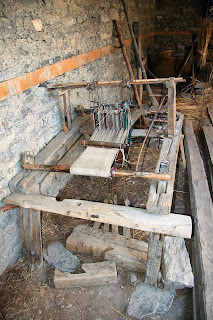 A simple loom, but as you can see it definitely worked very well and for many years. Some of the artifacts like this loom were 50-100 years old. Tibetan Handicrafts Emporium The place Kent went to has closed its web site but this link takes you to a similar emporium in India where a great many Tibetans now called home. They were in a cotton drawstring bag and this was the printing on the bag. Inside was a cushion or pillow cover and a prayer rug. This cushion cover has a simple white cotton backing with a small zipper to slide in a pillow form and it's roughly 14" x 14". It is entirely covered in chain stitch, even the apparent white areas. Here's a closer look. The yarns seem to be pure wool and even feature variations in the dyeing. The second item from the bag was stunning: a prayer rug. Again, a simple cotton backing cloth and the front is lavishly covered in chain stitch. I have shown it here on our recently acquired antique 'waterfall' blanket box, and this is where the rug will stay. The stitches are quite uniform even though closely placed. I don't know if these are natual dyes or commercial synthetics. I suspect synthetic as when I gently soaked them in sudsy water, the colours didn't run. The colours came up much brighter for the cleaning. I left it to dry flat in the shade. The underside of the rug was a bit grubby or soiled and my brother mentioned having seen a woman ( either Nepalese or Tibetan) sitting on the dirt floor of a small tent and working stitches into a piece she was making. They live extremely simple lives there in conditions we can't imagine. "But they were always smiling and seemed happy" said Kent. Their calm acceptance of life was inspiring. So I for one understand why he went back a second time and who knows, maybe a third is in the future? Thank you for staying with us on this rather long post but as you can see, it was worth the time to do some 'arm chair travel'. I had ordered a stand to make her more user friendlier at home and at workshops and glad I did. I use an office chair on rollers and the ability to adjust the height of the chair is perfect. Jane only came with 200 heddles which struck me as a bit low for an 8 shaft loom even if it is only 16 inches wide. I ordered more heddles and waited for them to come. Once they were on and Christmas was past, assembly was completed and I started thinking about her inaugural warp. The recent woven Christmas cards had me fired up to do something for next Christmas, so I searched my stash for something suitable. I found a cone of fine bamboo 12 in a glossy ruby red that bought from Laura Fry's booth at Fibre Fest in 2006. I wound a short warp of 2.5 yards, sett 36 epi, to weave up a fine 8 shaft huck lace diamonds. It was planned to be just 5.5 inches wide and 200 ends. This is where the first error happened. I needed to count only 100 ends on the top of the warping board peg, but I kept winding till I got to the full 200. I had just doubled my warp width. Okay, now it's card inserts plus a couple of finger tip towels. No biggy. Then you flip the beater over the top to the back and the front is now all open and ready for threading. I moved the cords supporting the lease sticks down a bit lower, and threaded with the shafts raised up to lift them better into view. This is where the second and third problem happened. I took a long distance phone call and lost my place in the threading draft. Thought I had marked it but apparently not. So I ended up rethreading back to the original plain weave border at the start. Threaded again and ran out of heddles before warp. Still short! ??? Then I discovered I had doubled the plain weave ends from the planned 12 to 24 at the very start. Pull all through again and on the third attempt, I had success. But would it pass the error test when I threw the shuttle with some scrap yarn? Now, you flip the beater assembly back over and prepare to sley the reed. In this case Santa brought me a 12 dent reed (the loom came with a 10 dent reed) and I tied it off with soft cord to immobilize the beater and sleyed three ends per dent. I wove some scrap yarn and then made a small start with the fine bamboo. The lever action is nice and the cords run over rollers and pulleys. There is a small shelf on the top front of the loom for scissors and tape measure, but still pulled up a TV tray table. As to the other looms: the Louet Spring or 'Lilibet' is patiently waiting for me to resume the double weave sampler. It will need concentration and to be woven all at once for a consistent beat. On the Woolhouse countermarche or 'Emmatrude', I have just completed the fourth and last scarf of the 2/10 tencel warp and now weaving some samples to share with friends. The last scarf I used silk yak blend from Treenway and it was by far finer then the tencel weft or even the silk cashmere. The colour is a beige grey and lack any fuzzies that the cashmere had. The smoothness and sheen of the silk yak blend is *very nice* and I plan to use it again (and order more!) It's hard to see the colour here but it has a more masculine appearance for the darker weft. The overall pattern is smaller as well... tighter. That's the old counterbalance in behind and she's up for sale. I need the room and she's simply too big for what she does and how many shafts she has. It's like I brought home the new puppy before the old dog was ready to retire. I'm sure we'll all get along!